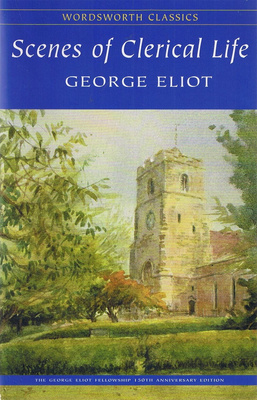 “Scenes of Clerical Life” is the title under which George Eliot's first published fictional work, a collection of three short stories, was released in book form, and the first of her works to be released under her famous pseudonym. The stories were first published in Blackwood's Magazine over the course of the year 1857, initially anonymously, before being released as a two-volume set by Blackwood and Sons in January 1858. The three stories are set during the last twenty years of the eighteenth century and the first half of the nineteenth century over a fifty year period. The Stories take place in and around the fictional town of Milby in the English Midlands. Each of the Scenes concerns a different Anglican clergyman, but is not necessarily centred upon him. Eliot examines, among other things, the effects of religious reform and the tension between the Established and the Dissenting Churches on the clergymen and their congregations, and draws attention to various social issues, such as poverty, alcoholism, and domestic violence. At the age of 36, Marian (or Mary Ann) Evans was a renowned figure in Victorian intellectual circles, having contributed numerous articles to The Westminster Review and translated into English influential theological works by Ludwig Feuerbach and Baruch Spinoza. For her first foray into fiction she chose to adopt a nom de plume, 'George Eliot'. Her reasons for so doing are complex. While it was common for women to publish fiction under their own names, 'lady novelists' had a reputation with which Evans did not care to be associated. In 1856 she had published an essay in the Westminster Review entitled Silly Novels by Silly Lady Novelists, which expounded her feelings on the subject. Moreover, the choice of a religious topic for "one of the most famous agnostics in the country" would have seemed ill-advised. The adoption of a pen name also served to obscure Evans' somewhat dubious marital status (she was openly living with the married George Henry Lewes). For the settings and the stories, Eliot drew on her Warwickshire childhood. Chilvers Coton became Shepperton; Arbury Hall became Cheverel Manor, and its owner, Sir Roger Newdigate, Sir Christopher Cheverel. Nuneaton became Milby. Shepperton Church, described in detail in The Sad Fortunes of the Reverend Amos Barton, is recognisably that at Chilvers Coton. Further, the scandal attached to the curate of Chilvers Coton, whose wife was an intimate friend of the young Mary Ann Evans' mother, became the story of Amos Barton. Likewise, "Janet's Repentance" was largely based on events that took place in Nuneaton when the young Mary Anne Evans was at school, and which were recounted to her by her friend and mentor Maria Lewis. Mr Tryan is an idealised version of the evangelical curate John Edmund Jones, who died when Evans was aged twelve; the Dempsters seem to have been based on the lawyer J. W. Buchanan and his wife Nancy. Tryan's main area of concern, Paddiford Common, "hardly recognisable as a common at all", is similarly based on a real-life location, Stockingford. George Eliot's intellectual journey to agnosticism had been circuitous, taking in "the easygoing Anglicanism of her family in the 1820s... the severe Calvinistic evangelicalism of her youth in the 1830s and her crisis of faith and search for a secular alternative to Christianity in the 1840s". (It should be noted that, during her evangelical phase, she was an evangelical Anglican; Maria Lewis, her mentor during this period, was anti-Nonconformist and refused to take a position as governess in a Nonconformist household. This distinction is important; during the nineteenth century it had significant implications for class and status. The Church of England enjoyed a unique position as the established church, and all the clergymen in Scenes of Clerical Life, including Tryan, are portrayed as being members of it.) By 1842 she had become agnostic, refusing to attend church with her father. Her friendship with Charles and Cara Bray, Unitarians of Coventry, and her theological studies, was probably responsible for her renunciation of Christianity. Scenes of Clerical Life is sympathetic to the Church and its ministers, however; Eliot "was too secure in her own naturalistic ethics to need to become crudely anti-religious. What she demanded was a freedom from fanaticism, dogma, intolerance and inhumanity in the preachers of the Gospel".